February 22 is celebrated as Independence Day in Saint Lucia, a small island country in the Caribbean Sea. On this day in 1979, Saint Lucia became a fully independent state within the Commonwealth of Nations. Saint Lucia may have been sighted by Christopher Columbus in 1502, during his fourth voyage to the Americas, since he made landfall on the nearby island of Martinique. However, there is no mention of the island in his log. The name “Saint Lucia” can be first seen on a globe in Vatican made in 1520. The colonization of Saint Lucia began in the early 17th century, when 67 English sailors founded a settlement after being stranded on the island by a storm on their way to Guyana. However, they suffered continued attacks by a local tribe. In several months, the few surviving colonists fled the island. According to documents, a permanent British settlement on Saint Lucia was founded in 1635 by colonists from Bermuda. In that same year, another settlement was established by the French. For over two centuries, the French and the English fought over political control of the island, which passed from hand to hand several times. Saint Lucia became a French crown colony in 1674. After several conflicts, Britain and France agreed on it being a neutral territory. However, the French eventually took back control of the island. The English raided and occupied Saint Lucia in 1762, 1778 and 1796, but every time it was restored to French control. Finally, the British regained Saint Lucia in 1803. The island was officially ceded to Britain in 1814 and incorporated into the Windward Islands within the British West Indies in 1838. The first half of the 20th century was marked by increasing self-government on the island. Following the adoption of the 1924 constitution, Saint Lucia received its first form of representative government. As the colonial system began to collapse after World War II, Saint Lucia began to approach its independence. In 1958, Saint Lucia along with other former Caribbean colonies became part of the short-lived West Indies Federation, a semi-autonomous political union created by the United Kingdom. In 1967, it became an associated state of the UK. Saint Lucia had full control of its internal issues, but its defense responsibilities and external affairs were left to the UK. Association with the United Kingdom was an interim arrangement meant to assure the former colony’s smooth transition to independence. It ended on February 22, 1979. 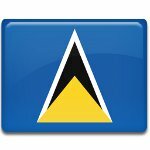 On this day, Saint Lucia achieved its full independence. However, it chose to become a member of the Commonwealth of Nations, which means that Saint Lucia recognizes the British monarch as titular head of state. Although Independence Day is an important public holiday in Saint Lucia, it is not the country’s national day. National Day of Saint Lucia falls on December 13, the feast of Saint Lucia of Syracuse, commonly known as Saint Lucy’s Day. Saint Lucy is the namesake and patron saint of Saint Lucia. Her feast day is marked with the National Festival of Lights and Renewal.